Japan’s All Nippon Airways (ANA) has announced plans for a new service between London and Tokyo Haneda Airport, amid rising demand for the route, Air Market said in an online report. The new service, effective from March 30, 2014, also follows the news from the Japan National Tourism Organisation that the country is likely to hit the ten million visitor mark by the end of 2013. Haneda Airport is increasingly seen as a hub, due to its accessibility for central Tokyo (13 minutes by Monorail) and the range of domestic flights, enabling easy access to popular Japanese destinations such as Hiroshima, Matsuyama and Okayama. The expansion will make ANA the biggest airline at Haneda Airport, offering the most international flights to and from this airport. ANA adopts a dual-airport strategy in the Tokyo area, capitalising on the strengths of Haneda and Narita Airport. Routes and schedules for destinations between the two airports are claimed to be carefully planned to complement one another, offering passengers more choice and convenience, and meeting the growing demand for international travel. Osamu Shinobe, ANA president, said, ‘With the new slots being added to Haneda Airport, we are seeking to utilise the strengths of both Haneda and Narita airports to offer an increased level of convenience for domestic and international routes, gaining new international customers travelling between Japan, North America, Europe and Asia. ‘Also in-line with the Haneda expansion, ANA is planning to offer an enhanced lounge and services, delivering a five-star airline experience both in the air and on the ground, allowing customers to experience Japan Quality at all times,’ he added. ANA is planning to launch a new UK marketing campaign in late-December to support the expansion. ANA’s ‘By Design’ campaign focuses on the beauty of Japanese culture and its tradition of exceptional service, as part of efforts to attract more business travellers, as well as others to the country. UAE-based airline company, Emirates, has increased its commitment to Japan with the introduction of a new service between Dubai and Tokyo International Airport (Haneda Airport). Thierry Antinori, Emirates executive vice president for passenger sales worldwide, said, ‘As Emirates’ third gateway in Japan, the Dubai to Haneda route will help to build on the vibrant relationship between the United Arab Emirates and Japan, in terms of trade and increasing the opportunities for business and tourism. Emirates has been operating to Japan since 2002 when we introduced non-stop flights to Osaka; our commitment continued when we launched flights to Narita International Airport in 2010. The airline had previously announced another new service, this time to Poland, commencing from February 6, 2013. The airline is offering a daily service to Warsaw in Poland, from Dubai in the UAE, with a 237 seat Airbus A330-200 aircraft. The airline is currently offering five flights daily for its passengers from London Heathrow Airport in the UK to Dubai, as well as two flights daily to Dubai from Glasgow Airport in Scotland. The airline also offers direct to Dubai flights from Birmingham, London Gatwick, Manchester and Newcastle airports in the UK. Fujita Kanko Inc, a hospitality company based in Tokyo, Japan, has announced the opening of the Hotel Chinzanso Tokyo, due for January 1, 2013. The hotel, earlier known as Four Seasons Hotel Tokyo at Chinzan-so, will be operated as Hotel Chinzanso Tokyo, by the company itself. The company was earlier operating the separate meeting and conference facilities located in the same property complex, and has added the hotel to its portfolio. Chinzanso means ‘villa on a mountain of camellias’, and is located inside a 16.3-acre Japanese botanical garden in the centre of Tokyo, within walking distance of Edogawabashi subway station, and close to the Mejiro JR station. The hotel is also located next to the Kanda, on the riverside, offering a location to observe the annual sakura (cherry blossom) season in Japan. The property includes event spaces, such as 22 banquet and meeting rooms; and six restaurants, along with the hotel building itself. Hotel Chinzanso Tokyo features 259 guest rooms and 36 meeting rooms. The hotel will be taking reservations for its grand opening from July 2, 2012, from its new website. The company intends to invest around £60 million in next three years on property renovations and upgrades. Agoda.com, Asia’s global hotel booking site and part of Nasdaq-listed Priceline Group, today announced hotel specials for the Tokyo International Film Festival. Taking place from October 22 to 30, TIFF is held annually in several venues across Tokyo, most events staged within Roppongi Hills in the Minato area. Roppongi Hills is a multi-function urban development comprising boutiques, cinemas, restaurants, art spaces and sculptured gardens, providing a cosmopolitan backdrop to this glamorous international event. This year, two opening films kick off the event: Hollywood action ‘The Three Musketeers’, and Jackie Chan’s ‘1911’. The latter is Chan’s 100th film and is both directed by and starring the Hong Kong superstar. Other highlights include a retrospective of iconic Japanese actress Kyoko Kagawa, a presentation of Yasujiro Ozo’s 1953 masterpiece ‘Tokyo Story’, and a screening of ‘Moneyball’ with Brad Pitt, which will officially close the festival. Aside from movie screenings, TIFF includes special appearances by actors and industry-related seminars and symposiums. The theme of this year’s TIFF is “Believe! The Power of Films”, which promotes Japan’s recovery from the tsunami by uniting people through a love of film. TIFF’s main fund-raising project is the ‘ARIGATO’ wristband campaign, with all donations send to the Japan Red Cross. The project recently raised funds and awareness at Cannes Film Festival, where film people from around the world showed their support through donations and well wishes. As a travel destination, Tokyo is as vibrant in real life as it is onscreen. The nightlife of Shibuya, the shopping of Ginza and the costumed kids of Harajuku are even more exciting in person than they are in pictures, and travelers are assured an unforgettable experience in Tokyo at any time of year. agoda.com has secured a selection of special rates just for the Tokyo Film Festival. Rates are for a limited time only, so book early! Save 40%. Rates from USD 251 per night for The Main Standard Room. Valid until October 30, 2011. Save 20%. Rates from 163 per night. Minimum stay 2 nights. Valid until October 31, 2011. Save 30%. Rates from USD 91 per night. Valid until October 31, 2011. Save 15%. Rates from USD 163 per night. Must book at least 14 days in advance. Valid until March 31, 2012. Save 50%. Rates from USD 118 per night. Minimum stay 2 nights, check in Sun or Mon. Save 20%. Rates from USD 166 per night. Valid until October 30, 2011. Save 20%. Rates from USD 120 per night. Valid until March 13, 2012. Save 10%. Rates from USD 124 per night. Minimum stay 2 nights. Must book at least 7 days in advance. Valid until November 23, 2011. Save 30%. Rates from USD 138 per night. Minimum stay 2 nights. Valid until December 30, 2011. Save 20%. Rates from USD 222 per night. Minimum stay 2 nights. Valid until December 31, 2011. The warning of only travelling to Tokyo for essential travel has been downgraded by the Foreign and Commonwealth Office. After weeks of uncertainty following the earthquake and devastating tsunami that left the Fukushima nuclear plant worryingly close to a nuclear disaster, Japan is now welcoming tourists back. Last year 8.6million tourists came to Japan, and considering the huge price tag for the series of disasters is thought to be at £122billion, the decision to downgrade is certainly a welcome one. Especially as Spring is a very popular time for tourists wanting to see the beautiful cherry blossom season. Since the earthquake on March 11th, which subsequently damaged the nuclear reactors and radition appeared to by leaking, the FCO had warned against travel to Tokyo. Although Tokyo is 130 miles south of Fukushima, it was feared radiation would reach the city. Due to the destruction to the infrastructure to the north-east of the capital, the FCO is still advising against travel to this area, but Tokyo is now considered safe as long as no further disasters occur at the Fukushima plant. However, Britons have been advised to follow ‘precautionary measures’ if radiation levels do increase. There’s no city quite like Tokyo. The Japanese capital is both the biggest city in the world and one of its most culturally interesting, combining three-hundred-year-old temples and skyscrapers, rich cultural gems with cutting-edge technology. When it comes to experiencing high-tech Asia, there’s truly no real alternative to a quick trip through Japan’s mega-metropolis. But Tokyo has a semi-deserved reputation for expense, particularly for travellers. Ranked as one of the world’s most expensive cities for expatriates, the megacity is often thought of as a destination for those with Herculean budgets. We don’t think so – with the right spending strategy and a bit of calculated frugality, the Japanese capital can be a good budget travel destination. Where to start? Pick a hotel that’s outside of the city centre. Tokyo has the world’s most effective public transport system and it’s pointless to ignore it by booking into a central hotel. Provided your room is within walking distance of a train station, it’s no less convenient than one in Shibuya or the Shinjuku business district. Don’t eat out, eat up. Tokyo’s ground floor restaurants tend to be overpriced and disappointing, with basic plates of ramen attracting five-star prices. Find better prices and better quality by walking up a floor or two. Third and fourth-floor restaurants in Tokyo tend to be less expensive, more friendly, and less crowded, giving you a better travel experience and better food. Finally, learn basic Japanese. Tokyo is expensive and impersonal at first, but with a basic collection of Japanese phrases on your side it quickly becomes a manageable city. Arm yourself with a concise phrasebook and take note of some simple Japanese sentences, particularly ones related to housing or eateries. Japanese people love to help you out, provided you’re willing to put in some effort first. Snuggled into Japan’s fashion capital in Harajuku is Yoyogi Park – a large relaxation area offering all a tired traveller could need. Known internationally for the bizarre costumes on display and the public martial arts classes, the park is thought of as Tokyo’s natural fashion runway. Every Sunday, without fail, the park is filled to the brim with cosplayers and wannabe fashion models. It’s an occurrence that, outside of Japan, would inspire bizarre stares and a bevy of cameras. But in this strange pocket of cosmopolitan Tokyo, walking through the park in a gothic costume is normal to the point of being bland. Yoyogi Park is truly an sight to behold, with a sea of creative costumes on display for the entire city – boasting a popular of over thirty million – to see. 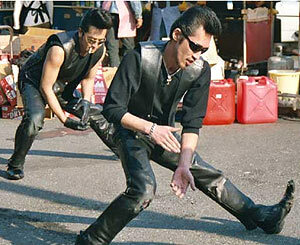 But there’s more to the Yoyogi area than just unusual costumes. The district is part of Japan’s large fashion industry, housing cutting-edge brands and the country’s more classic houses such as Issey Miyake. While Akihabara represents the centre of Tokyo’s gigantic technology markets and vibrant computer culture, Yoyogi is the nation’s capital of fashion and bizarre visual innovation. It’s also the home of Japan’s first flight, performed in 1910 by the country’s early military. Now it’s a reminder of Japan’s difficult economic past – throughout the edges of the park, a series of camps are erected, offering residence to Tokyo’s large and almost completely accepted homeless population. In a city renowned for its wealth and productivity, Yoyogi is a reminder that things can sometimes fail. If the city has become too much for you, think of Yoyogi Park as an alternative to a lengthy trip to the outskirts of Tokyo. It’s central, yet remarkably fresh and tolerable. Given the bizarre costumes on display throughout the weekend, this is one destination you can’t afford not to see while in the world’s most exciting and interesting capital city.